The countdown for this years Tangible and Embedded Interactions conference is coming to an end. On 23rd of January the confrence is starting in Funchal / Madeira / Portugal. Unfortunatly without the TUI Blog crew for the first time since three years. Yeah, it´s a pity, because it would be great to be there, meeting all the guys and seeing fantastic projects. Next time! For sure! The blog is about an upcoming exhibition at the MOMA in New York that features projects on interactive design. I´m allready super curious what they will further choose from their allready impressing list. Please take yourself time to scroll through the projects, click at the hyperlinks and repost some ideas that are worth to be presented at the MOMA aswell. 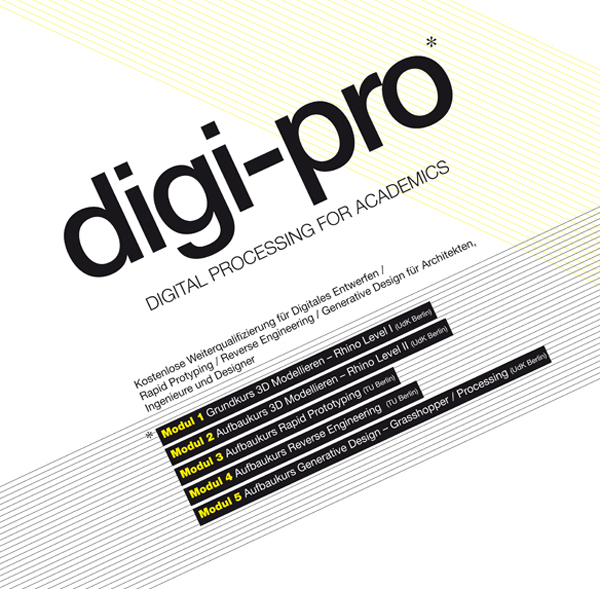 There will be “Digital Processing” tutorial courses for designers, architects, construction engineers and young academics in these fields taking place in Berlin this year. The project is inititiated by the 3D Lab at the Technische Universität Berlin and the faculty of architecture at the University of the Arts Berlin. The people behind this offers are also involved in the 3D Modelling Symposium that is used to happen every year in Berlin. After the success of the last years, the symposium will be back again 2010 with a call for papers and several workshops and lectures. What is most interesting on this offer, is the Module 5 on “Generative Design” using the Rhino4 Plugin Grasshopper. With this parametric scripting tools some new and “your-design-pushing” possibilities come up especially for Rhinomodellers and Non-coders. It´s definitely worth checking out, because on one hand it´s free and on the other hand it fills one of the most leaking gaps in Rhino: the missing of parametrics. For everyone interested further in generative design and scripted shapes, the ARCH+ issue n°188 will provide a perfect overview on the topic. Also the Modules 3 and 4 on rapid prototyping are recommended. The 3D Lab is well equipped with several object printers and a 3D scanning facility so there will be hands on experiences and professional guided courses. When it comes to scripting plug ins, I also would like to share Scriptographer for Adobe Illustrator with you. 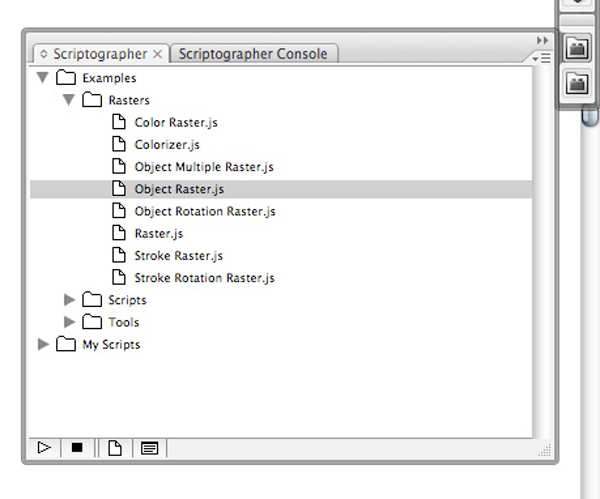 Scriptographer is an open source development with a broad bunch of contributers pushing up new scripts for graphical and free use. The Plug in is easily installed and has incredible features in his current build, such as a live scripting environment using Java. But the most handy part is the rasterizing section, that enables you to make any vector grids out of bitmap graphics. OK, that doesn´t sound so stunning, but everyone who once tried to make one these dot matrixes on his or her own will really appreciate that function.